It has been a beautiful week – a joy to be in the garden and walk the dogs, although that is a pleasure whatever the weather. I spent a great weekend ( well Friday night home Saturday evening) in County Durham grouse pointing with Vita. It was too far for a day trip so I went up the night before. My first try at this aspect of working her and tests her ability to find game. She has to let me know where the bird is by pointing, then sitting as the bird takes off. This time we didn’t achieve a grading but Vita had a great time and it was a super day out on the moors for me. Peter stayed home with the other two dogs and took part in the end of season skittles final .The team lost by 3 points which was so close but there is always next year. 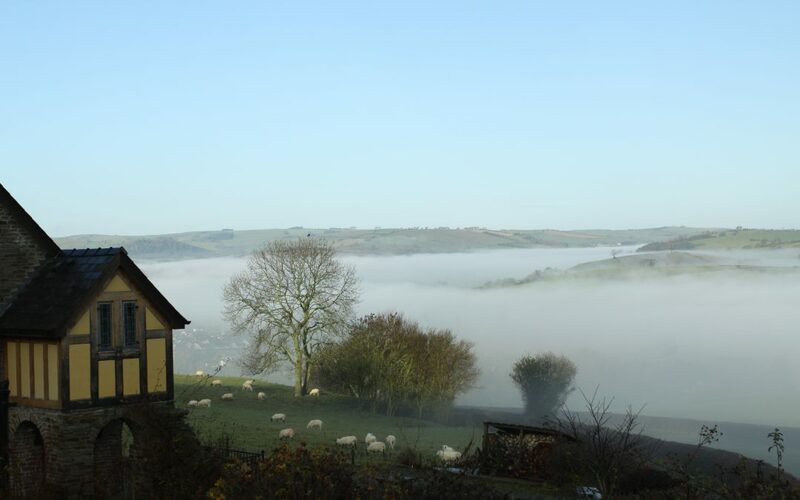 My trip away made me very aware of how lucky we are to have such a wide range of beautiful countryside on our doorstep – rolling hills and pastureland, woods , rivers and moorland. This week the weather has been in stark contrast to last week which is a shame as we had a friend staying! Didn’t dampen our enthusiasm just meant that on two days instead of country walks it was snowball fights!!! The dogs absolutely loved it and went wild. We still managed an afternoon at Arley Arboretum . I don’t know why we hadn’t been before and we will definitely visit again. A wonderful garden ranging from a formal Italian style area with fountains to wildlife ponds.Lots and lots of beautiful trees both large and small. We had booked afternoon tea and were not disappointed fresh sandwiches, delicious cakes and an endless supply of tea. Maybe we should have eaten first and walked it off afterwards! Enjoyed a very good meal at The Crown in Clunton before our friend went home. This pub has gone through a few ups and downs over the last year but I hope that the current tenants will gain support as they really deserve to. We all agreed that the dishes we chose were delicious so came home happy and content. Looking forwards to our next visitors so we can venture out and enjoy some more attractions and meals. THE BOTHY – Sunday 14th April for 5 nights in the first Easter week at £252 and Monday 22nd April for the second Easter week at £350. Here are some of the events that are on during 2019 in our area. 16th June Ludlow secret Gardens – a great opportunity to see behind the houses lining the streets of Ludlow not only the gardens but how the buildings all mesh together. 22nd/23rd June Clun Gardens Open 29th/30th June Shrewsbury Food Festival. Ludlow Races throughout the year January – May / October – December. Well the Christmas decorations are packed away for another year and all the leftovers are eaten ( except for the Christmas cake – any offers!) 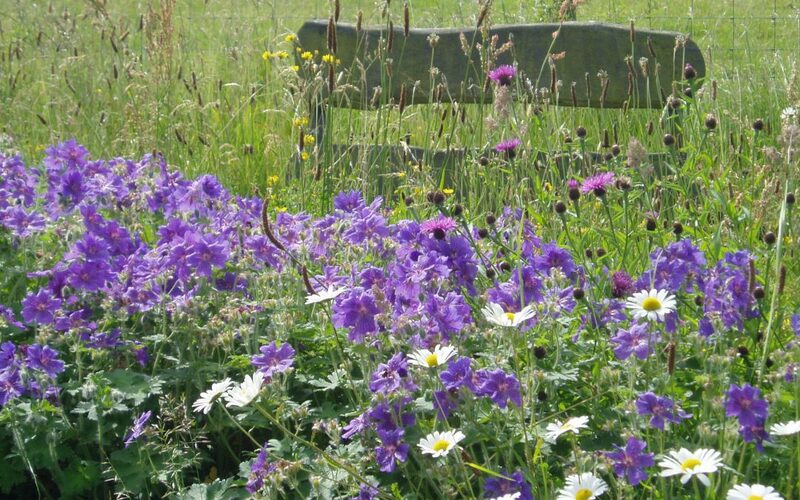 so it is welcome to 2019 and let’s hope for another lovely Summer when we can sit in the garden and enjoy the sunshine, the views and let the outside world pass by – if only for a short time. It maybe a quietish time for holidays but we take advantage and get out the paintbrushes , cleaning rugs and catching up with all the little bits and pieces that can’t be done during our busier times. We are looking forward to being able to welcome guests – old and new- throughout 2019. THE BOTHY – March 29th or 30th for a week @ £265 , the last of the low season rates. 5th or 6th April for either 6 or 5 nights @ £284 / £252. Finally from Sunday 14th April for the first Easter week at £350. KEEPER’S COTTAGE from Good Friday or Easter Saturday for a week at £427. 29th June Shrewsbury Food Festival. Details can be found on Clun, Shrewsbury and Ludlow’s own websites and also at Virtual Shropshire and Shropshire Tourism. At last we are enjoying a run of good weather and thanks to the Green Man the sun has been shining over the Clun valley and the forecast is good. All our indoor jobs are completed and we are really proud of Keeper’s new bathroom and the bedroom carpet. Time to get out into the garden, there are a few gaps so I need (!!!) to go to the garden centre. October’s pots have lasted well and the violas are still going strong but I do feel that I need to get some more vibrant colour to complement what is in the garden. We are about two to three weeks behind so I am crossing my fingers that the roses will be late enough to feature when the garden is open for the Church in June (24th Clun Gardens Open – lots of hidden treasures to explore plus plants to buy and afternoon tea). I have been very remiss in not completing this blog earlier but life has been busy and nice weather is too much of a temptation – outside is so much better than in! The cottages are busy and our guests are enjoying sitting out with their feet up after a day sight seeing or walking. The garden pots are planted up with geranium and lobelia, most of the beds are weeded and believe it or not one of the water butts has run dry already. Those who know me well know that I compete in Working Tests with our younger Spinone and having progressed into the Open group, training has been my main priority this year as the transition from Novice to Open can only be described as a total shock! I have taken part in one test with mixed results, Vita is a total swimaholic but on the day when I asked her to cross some water to retrieve a dummy she looked at me as though I was completely mad. Ah well that’s dogs for you. The Bothy is available from the 24th October for 4 nights at £185 . The Gatehouse has one late availability from the 20th October for 4 nights at £298 . 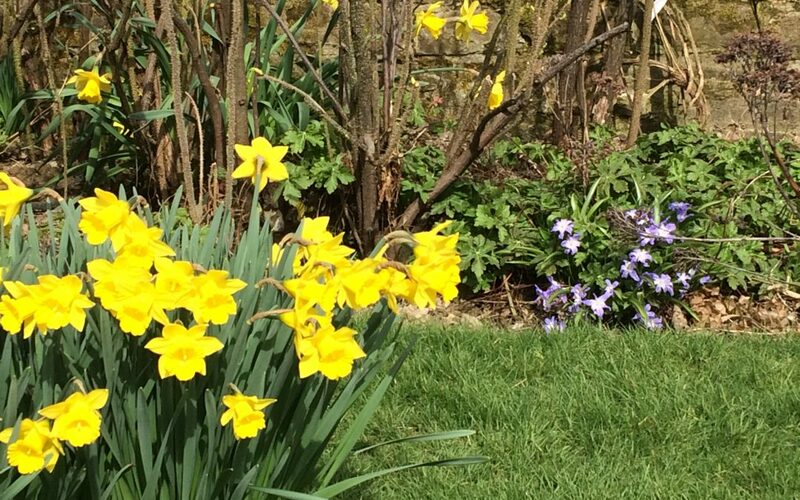 At last I can report that Spring has arrived in Shropshire and at Pooh Hall – hooray!!! It has been lovely to be able to get out into the garden without numerous layers of clothing and waterproofs. I tried to photograph my first sighting of a bumble bee but he buzzed off ( !!! ) so there are just some daffodils and chinoxia. The grass is beginning to grow and hopefully we will have some lambs in the fields next to Pooh Hall before long, then it truly will be Spring. Peter has continued with his DIY upgrades around Pooh Hall and has just completed the dog shower. He has moved it to a more sheltered spot and provided steps for the dogs to reach the shower tray. Thank you to Lynda, Ian and their two dogs for road testing the new facilities and their helpful suggestions to make it more user friendly ( sorry to Lynda for getting wet first time out – problem solved with a splash back at the front). In a couple of weeks time the new carpet will be fitted in Keeper’s Cottage and the bathroom floor tiled , then we can just look forward to welcoming our guests and enjoy sharing beautiful Shropshire and our idyllic little corner of it with you all. I have three discounted late availabilities in June – something for everyone! All are discounted by 10% unless stated otherwise. The Gatehouse We have one weekend break at the beginning of June at £283 from Friday 8th June departing Monday 11th June. The Bothy due to a late cancellation this cottage is available from Wednesday 13th June for 3 nights at £211. 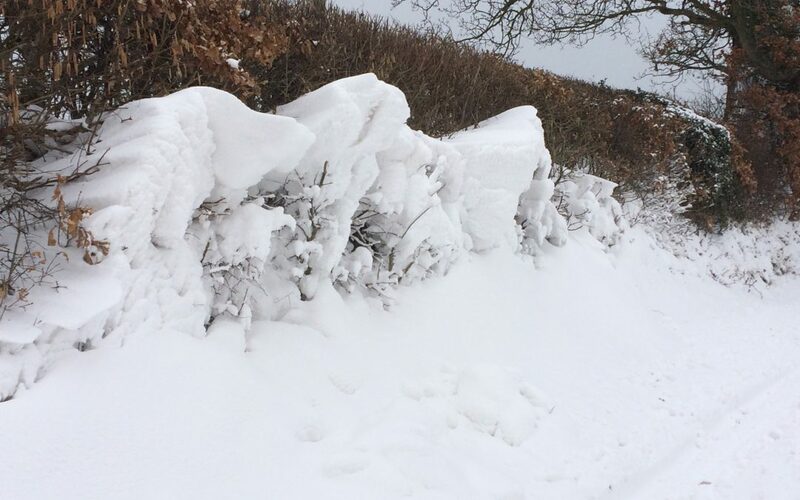 I really didn’t think that at the beginning of March I would be writing this blog confined to quarters because of the snow! For the first time since we moved here in 2004 we have been unable to get out – except on foot. Having donned our coats, hats and gloves, picked up our trusty snow shovels and shovelled our way down to the by-way we found that the snow plough had not been through and the drifts on the road made it impassable for all but a few ( those whose determined efforts meant driving a 4×4 and using the bank on the roadside to get around the blockage). Having been a passenger in one of those vehicles I can truly say that it wasn’t for the faint hearted!!!. March is usually a time when the daffodils are starting to come into bud and they were, no doubt once this has melted they will resume where they left off. The thaw has started and hopefully our guests will be able to get here to enjoy the wonderful snowy views – yes it does have an upside too!! Peter has worked really hard to finish the decorating and upgrading Keeper’s bathroom. The old bath had begun to show signs of wear and tear and wasn’t suitable for a shower but the new installation gives much more space and allows for the shower attachment to be used as a proper shower. We are really pleased with the results and Peter has put photographs on his Facebook page. The floor is the only thing left to do and when we arrange for the carpet to be replaced in the bedroom we will do the bathroom floor at the same time. We are ready to attack the garden just need this snow to melt!!! I have six discounted late availabilities in April so something for everyone! The Bothy is available from Sunday 8th April for up to 5 nights at a cost of £252 and then again from Tuesday 17th April for 4 nights at £220 and finally from Sunday 29th April for 5 nights at £252. The Gatehouse has availability from Friday 6th or Saturday 7th for a week at £427 and again from Friday 27th April for a week at the same price. Keeper’s Cottage has one availability from Saturday 28th for a week at £387. Happy New year to all from us both at Pooh Hall. 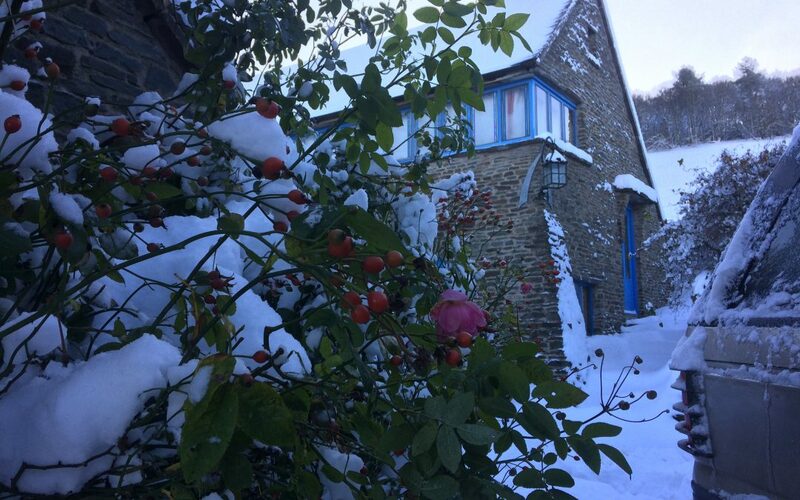 The last flurry of snow gave me the opportunity to take this photograph of the remaining roses ( sheltered by the end wall of The Bothy) against the fluffy white of the snow. I think that it is the first time we have been able to see both at the same time! The new year has started with the usual frenzy of painting and decorating. We take the opportunity at the beginning of each year to freshen up the paintwork and complete any work that is needed in each cottage. This year Keeper’s Cottage is getting new curtains in the sitting room and a new bath. We have already upgraded the television in this cottage. The Gatehouse has a snuggle seat with reading lamp and an upstairs television and Peter has very nearly completed the painting. Finally The Bothy has been painted throughout. The Bothy – for up to 6 nights from Sunday 11th March at a cost of £238 , this is a lovely cosy 4 Star cottage with wood burner. Again from Sunday 25th March for up to 5 nights at £212. The Gatehouse – from Friday 2nd March for a week at £351. 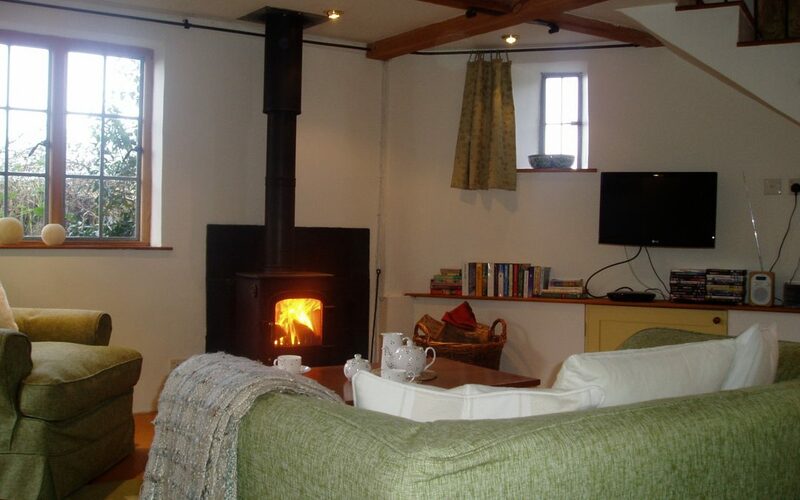 This is a spacious 5 star dog friendly cottage with wood burner and open plan layout.